Game 109: Rockies rock a pitcher named Brock in Dodgers’ latest loss. Brock Stewart’s second major league start left him with a career earned-run average of 14.00, and the Dodgers with a 12-2 loss to the Colorado Rockies. Newly acquired starting pitcher Rich Hill is throwing without pain, and could make his Dodgers debut this weekend against the Boston Red Sox. 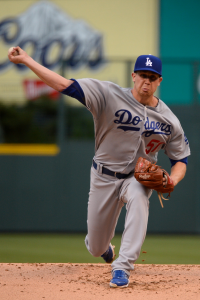 Earlier in the day Wednesday, the Dodgers made a slew of roster moves. Stewart could be the next move tomorrow; he was optioned back to Triple-A immediately after his first spot start earlier this year. This entry was posted in JP on the Dodgers, Postgame thoughts and tagged Brock Stewart, Colorado, Rich Hill, Rockies by J.P. Hoornstra. Bookmark the permalink.